Get scrubbed, clean data from Bookyourdata.com when you buy this directory of general surgery contacts. Find those working in general surgery at multiple hospitals and clinics with this vast, accurate, and human-verified directory. Practice pharmaceutical and medical marketing with precision. General surgeons require vast medical and surgical knowledge, often working on several areas of the body, from soft tissue to abdominal organs to endocrine organs. They can help in emergency rooms and can assist a wide variety of patients with different diseases and health issues. This area of surgical specialty requires a huge amount of medical knowledge as well as a large array of medical equipment, pharmaceuticals, and supplies. If your company can provide surgical products, then let those working in general surgery know about it! Market to physicians with a specific need and interest with the help of this data product from Bookyourdata.com. 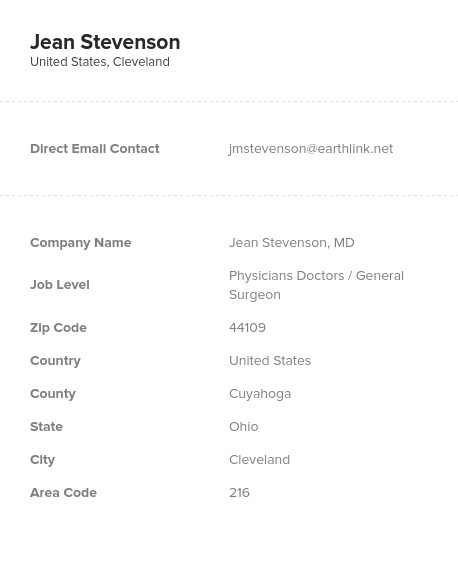 By pulling a vast list of general surgeons into one downloadable data file, this resource allows you to find the people who will have a vested interest in your products, whether they be surgical supplies or pharmaceuticals. That means you can waste less time during your medical marketing campaign and find more sales-generating contacts. With Bookyourdata.com, you'll be able to find, network with, and market to physicians in general surgery today. Getting started is simple; download this list, pull it into your CRM, and start making new connections in minutes. This pre-built data product is ready to download now!